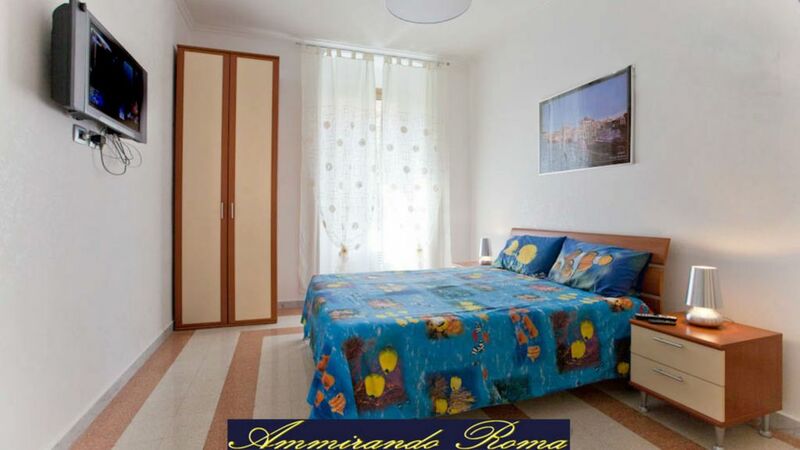 Ammirandoroma is a renovated apartment this year and consists of a double bedroom with possibility of extra bed and another double room also for single use with possibility of an extra bed, a large kitchen and a bathroom. Is located within a very quiet complex built in the early 1900s and is well connected, 200 meters is the metro Re di Roma that will allow you to reach any historic site of the capital. Excellent host and property. I will stay again at this or any other propert from same host. The apartment is excellent and exactly as described on the VRBO site. The host is so wonderful, helping and kind that we felt welcome in new country. The restaurants,grocery, metro, bus and main attractions were so close that we did not waste any time reaching to anywhere in city. The host even allowed us to checkIn early as our flight was early in the day. My family of five has nothing but great memories of this vacation in Rome. Great location and good value! We enjoyed our stay at this apartment very much. We felt like we were right in the heart of the city, with the metro only a few blocks away, a bakery for coffee, grocery store, and various restaurants within a five minute walk! The colosseum is only 1 km away! Fabricio was very accessible via whatsup and answered any questions that we had. They had all that we needed for cooking, linens. Towels. Etc. The apartment itself could use a new coat of paint and a little tlc, but it was actually perfect for us with kids and really a great value for the location. The owners were friendly and helpful, the complex was pretty and the flat was spacious and comfortable. This is an apartment in an apartment complex. Fabrizio, the owner was more than helpful. He arranged for a taxi from the airport to our front door. He provided maps and tips which was great since we had never been in the country before. We were able to communicate just fine though I knew no Italian. There were some surprise charges. No big deal just so you know to have some extra cash to pay taxes and cleaning fees. The apartment was spacious for the four of us. It had a washer/dryer combo which didn't seem to work very well so we hung our clothes to dry. Perhaps I wasn't using it correctly. There was a nice restaurant nearby which we enjoyed several times. The neighborhood was very urban. If you're up for a good long walk, you can walk to the Coliseum from there. But there is also a nearby subway within a few blocks as well. I'd stay there again. I thought it was a good value for the price. We stayed here June 17-20,2016. Fabrizio arranged a driver to pick us up from the airport and take us to the apartment. It was 55 euro, if you take the train in it is 12 euro per person so for four of us it was a little more but then we did not have to do the train and walk and find the apartment. The apartment is wonderful. It is located in a nice residential area and the metro is about 3 blocks away. We were able to get everywhere we wanted on the metro. I have nothing but praise for our stay there. We enjoyed our time in Rome and it was nice to come back to the apartment and relax after a long day of sightseeing. There is a grocery store in the Piazza di Roma which is a little tricky to find but once we did, we were able to buy everything we needed for our stay. A restaurant called Picadilly that is near the piazza di Roma is a nice place to eat. Just a quick note. There is one switch in the bathroom that turns on/off the hot water heater. If you accidentally shut it off, like we did, it takes awhile to heat the water back up. Totally our fault just be aware and don't accidentally shut off your hot water! We stayed five nights days in the apartment in January 2016. We were coming to the end of a six week trip through Europe and found the apartment a very good place to relax before our flight back to Australia. It was very spacious for the four of us and was well serviced with the metro and local shops. Fabrizio was very helpful when we arrived giving us some good pointers for how to get into the historic centre and the metro stations for some key sights. he also responded promptly when we had an enquiry and was right on time when we were checking out. One suggestion: If you are coming in from the airport by train consider stopping at Tuscolana station as it is about half the distance from the apartment compared to Roma Terminii. Nearby, you will find supermarkets, shops of all kinds, restaurants, pizzerias, dry cleaners and pubs within 100 meters. The holiday home is located in a quiet complex built in the early 1900s and consists of two double bedrooms equipped with LCD TV, desk, two chairs, air conditioning and two closets and a large kitchen. The taxi rank is just 30 meters finally we are very close to the stat. Roma Termini. To reach us from Leonardo da Vinci will find the train that will take you to 500 meters away. L'anticipo sarà del 10-15% sul totale del soggiorno e dovrà essere corrisposto subito dopo la prenotazione,mentre il saldo verrà effettuato il giorno dell'arrivo. I costi sono all inclusive e siamo disposti a vedere in base alle esigenze del cliente i costi finali. Si effettuano sconti per famiglie e/o gruppi Le tariffe dei last minute sono per un soggiorno di tre/quattro persone.